· Include all character types: When this radio button is selected, the numbers include all characters. ▪ Letters: Letters of all characters sets except Chinese, Japanese, and Korean character sets. ▪ CJK signs (Chinese, Japanese, Korean): Signs in the Chinese, Japanese, and Korean character sets. ▪ Digits: Digits of all character sets. 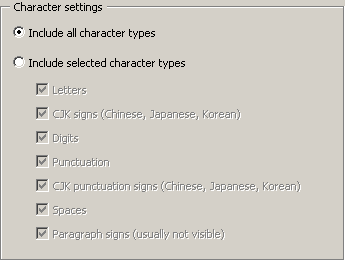 ▪ Punctuation: Punctuation signs of all characters sets except Chinese, Japanese, and Korean character sets. ▪ CJK punctuation signs (Chinese, Japanese, Korean): Punctuations signs in the Chinese, Japanese, and Korean character sets. ▪ Paragraph signs (usually not visible): Paragraph signs (if visible, shown as ¶).